The Runcible Spoon's Malaka Gharib just published her first little book: "Food Fantasies And How to Execute Them." It shows people, step by step, how to realize their craziest, most fantastical food fantasies. 24 pages, full color. Available for preorder on Etsy here. Canada artist, lover of vintage goods and zinemaker Zoe Christmas made this quick little gif inspired by The Runcible Spoon in a matter of five minutes after a special request on Twitter. It almost looks like the spoons have a little smile on each of them. Thank you, Zoe! Come to a Crowdsourced Community Cookbook-Making Extravaganza! 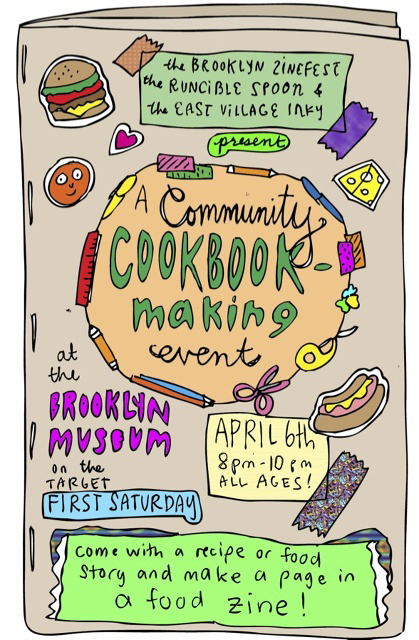 On April 6th, the Runcible Spoon is heading to the Brooklyn Museum in New York to host a Community Cookbook Making event in conjunction with the Brooklyn Zine Fest and the East Village Inky zine. This event is part of the Museum's Target First Saturdays, a monthly series of free art and entertainment programming. During the event, visitors are invited to come with a recipe or food story in mind, and create and design it into a page that may be used in an online community cookbook zine curated by The Runcible Spoon. Ayun Halliday from East Village Inky will give a presentation about zine culture and zine history, and Matt and Kseniya from the Brooklyn Zine Fest will be there to talk about the upcoming zine festival on April 21. What makes this event super cool is that we're getting people from all walks of life to be a part of print zine culture - and find a new place online in the age of the Internet. All you need to do is come prepared with an idea of what to write about. Heck, you could arrive with your story already printed or written out (here's a hint... the size of our pages are about half a sheet of paper). The Brooklyn Museum will supply participants with all the fixins: glue sticks, colored pencils, scissors and fun paper - so all you need to do is come with an idea! The Runcible Spoon is thrilled to be working with the community to create a totally crowdsourced food zine, which we hope to curate and complete within a month or so of the event. Stay tuned! Please help share this event by posting this on Facebook or Twitter! And don't forget to drop by the second annual Brooklyn Zine Fest at Public Assembly, featuring more than 80 zine makers and an expected 1,500+ attendees, on April 21! The Runcible Spoon Will Be at the Brooklyn Zinefest! Hello foodrats! Just want to tell you that the next issue of the RUNCIBLE SPOON is on BREAKFASTS! Email us at runciblespoonzine@gmail.com with an idea or leave one in the comment below! Come celebrate the Runcible Spoon's latest issue, "THE GROSS ISSUE," at the newly opened Kafe Bohem in Shaw. There will be gross foods for you to sample, and a Make Your Own Pizza Mask craft. And wine and beer and cocktails and snacks for sale! AND THE NEW ISSUE OF THE RUNCIBLE SPOON! Why haven't you baked your avocados before? Because you're stupid. Because you're unimaginitive. Because you've locked your dear, wonderful avocado to the constraints of guacamole, sandwich fillings and boring pasta salad. I visited Runcible Spoon Issue 6 writer Ashley Hamm recently, and she showed me the wise ways of the Baked Avocado. In case you don't remember Ashley, she is a vegan-surfer-activist-yogi who wrote about the impossible in our Holiday Issue: vegan gravy. So, I absolutely trusted that her baked avocados would be just as delicious. And delicious it was! I don't know why I never had it before, because it is absolutely wonderful. The avocados take on a creamy, soft consistency with a crisp, roasted top. Here's her recipe -- at least, what I remember of it (Ashley, you can correct me if I'm totally wrong!). You can substitute out the vegan ingredients for other things if you would like. Wrap each bottom of the avocados in foil. Bake at 400 degrees F for about 7 minutes. Take them out of the oven, and add a scoop of mayo in the center of each half, drizzle with Bragg's, and sprinkle on the remaining ingredients. Bake for another 5 minutes. Eat with a spoon. This is really good as a starter or a side dish.